Today I was reminded of the importance of smart packing. Today is my second day in a month-long Euro trip and all I’ve brought is a 28L backpack and a small tote. When we landing in Amsterdam yesterday it was warm…ok it was hot and humid, around 90. Today started out just as warm but not as humid, the weather forecast was calling for rain but the sky was clear and a brilliant blue. However, rain was on the docket. And rain it did. Just as we were walking to dinner it began to drizzle, nothing major, as we were eating, it started to pour. Just outside there was an oversized chess board with two men intently studying their game in progress despite the inclement weather. 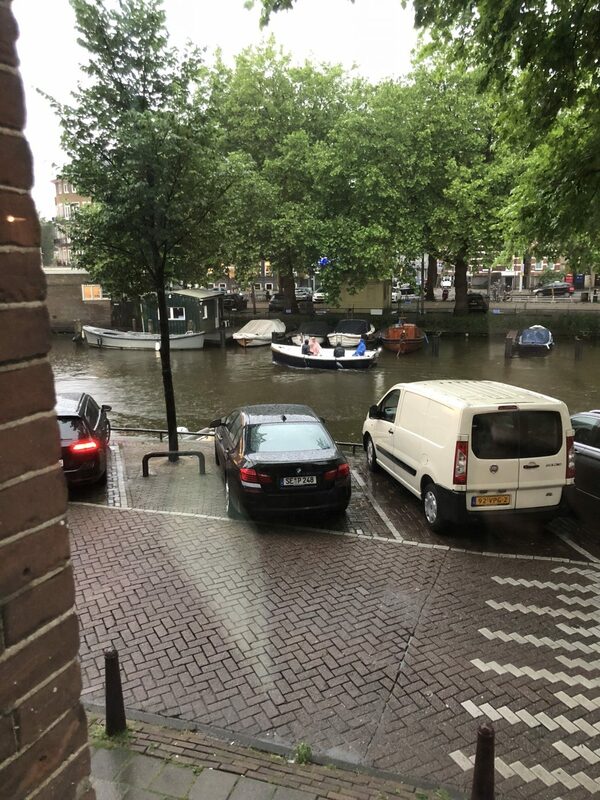 As I sit here in my hotel, which luckily, provides me with a view of a canal, I watch the tour boats navigate the narrow channel, regardless of the weather, and tourists, enjoying a view of Amsterdam they might not normally see. I’m smiling because it all reminds me of a saying that I’ve adopted while traveling. There’s no bad weather, just poor wardrobe choices. Today proved that was so true. On the walk back to our hotel my Mom insisted on getting umbrellas at a souvenir shop. Tacky “I Love Amsterdam” with a bike on the umbrellas. That $10 purchase of 2 umbrellas kept us relatively dry the whole walk home and my Dad who insisted that his thin windbreaker would serve him well, ended up soaking him straight through. Right idea, wrong wardrobe choice. At the end of it all, we laughed. Travel is about getting a little wet so that you can still enjoy that place that you may never get to again. It’s about shared experiences and creating memories. At the end of the day, the weather that most of us encounter on our journies should not be bad enough that it deters us from going outside. You can always change your clothes, towel off, and put on dry layers to warm up. These small inconveniences can help you discover things you may not have done otherwise on your travels. Now you can go to that museum that might have been low on your list of things to do and it may become the best thing you did all trip. Or you might make a new friend by sharing a bench under a tree and watch the rain together. Or you can find yourself staring out of the window of your hotel watching the canal traffic with a huge smile on your face while thinking how wonderful that it only started raining at 8 pm giving us the whole day to explore. What are some of your unexpected experiences? Let me know in the comments.